Paul opens the letter to the community at Ephesus with a blessing prayer and then describes Christ role. 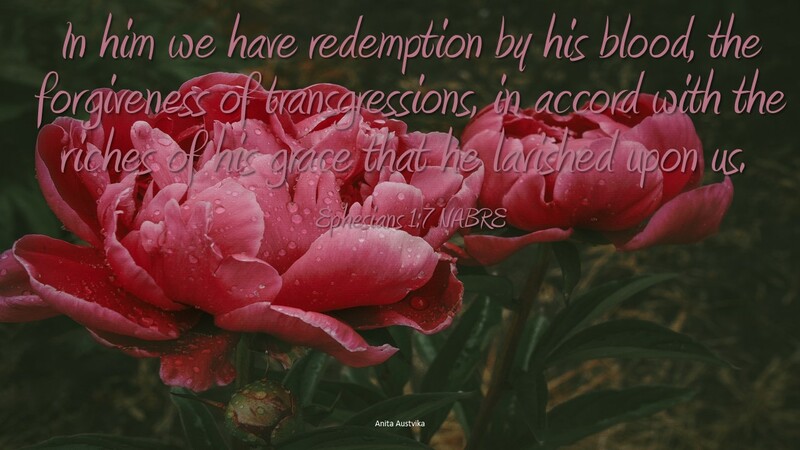 We are redeemed, meaning liberated, we were a slave or captive and now thanks to Christ that is no longer true. Christ’s liberation comes from the spilling of His own blood. It is a shorthand way to describe Christ sacrificial death on the cross in atonement for sin. Transgressions involve direct disobedience to God’s commandments. The riches lavished are God’s abundant favor that He freely bestows. It is the message of the new covenant, that Christ dies, rose and ascended all to show us what God will do for those whom He loves. We are blessed, we are graced, we and lavished with the treatment of glory from the creator of the universe. We could not be treated better. What did we do to receive this redemption, forgiveness and grace; nothing. It is all free gift from God to us His beloved. Paul’s message starts with blessing and that God redeems those whom he loves. Sin is taken away and while we may have been poor once we are rich with God’s grace. We have lived so long hearing the message that Jesus has taken away our sin that it may not seem extraordinary for us today. But it is extraordinary. If God is willing to die to show His love for us, imagine all the much simpler things we could receive for the asking. Our relationship with God is likely very one sided, with us receiving many blessings and forgiveness and giving very little in return. Often to receive riches from God all we need to do is say yes. We should live to give back showing our love for God. Are you open to what God wants to give you? What can I pray with you about?